The All-On-4 Clinic is a network of hand-picked specially trained clinicians with facilities throughout Australia that meet the required standards set by the brand to reflect its focus on immediate and fixed full set teeth replacement. Our principal dentist Dr Helen Arabatzis, a leading cosmetic dentist and implant surgeon, is one of the All-on-4 clinics handpicked senior associates. Our clinic has created a niche in offering advanced rehabilitation with our All-On-4 Plus approach, amongst other advanced treatments with dental implants. With the experience of thousands of implant placements and associated plastic and reconstructive procedures, and many hundreds of patients that we have treated using All-On-4 and All-On-4 Plus treatments, our results speak for themselves. The term ‘ALL-ON-4’ refers to the replacement of ALL teeth ON FOUR dental implants. It is a modern technique where the back implants are tilted 45º to provide the required support for total rehabilitation. Since fewer implants are used by comparison to older methods whilst still providing suitable support, there is less in the way of achieving optimal results. It also allows for simpler long-term maintenance and uncomplicated cleaning. Dental implants themselves are small titanium fixtures that are inserted into the jawbone and have, for a long time, been used to support a tooth or a segment of teeth. The fixtures form the foundation for the prosthetic replacement teeth. However, when we replace a full set of teeth, often referred to as full arch rehabilitation, whether in the upper or lower jaws or both, we do not need to place an implant under every tooth. We place 2 implants in the front of the arch and 2 in the back at an intended angle, and together these form the required foundation to support the prosthesis. By placing the implants at an angle, we are able to avoid the parts of the jawbone that contain nerves and are typically of poor quality. This mean we can rely on these to support the prosthesis fitted within days of the surgery. This procedure is the most common treatment in our clinic today for full mouth rehabilitation or single arch cases. Even in Upper jaw cases with extremely poor quality or quantity of bone, at the All-On-4 Clinic we can still offer reliable and streamlined immediate solutions using our own All-On-4 Plus and Zygoma Plus treatments. Why choose The All-On-4 Clinic? Experts and Innovators of All-On-4 Plus we are not just a brand name. At the All-On-4 Clinic you will be treated by the clinicians who pioneered All-On-4 in Australia and who are amongst the most reputable leading cosmetic dentists and implant surgeons. Immediate teeth that are permanent. 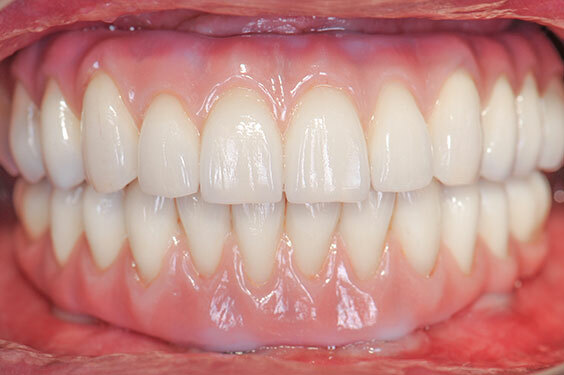 Our techniques facilitate the fitting of your custom made new teeth within 24 hours. Not merely a temporary solution, but one that is reliable that offers more favourable conditions for the healing of the implants and simplifies the cleaning process. We provide solutions for even the most atrophic jaws. Our Zygoma Plus treatment offers a solution with fixed replacement teeth for long-time denture wearers, who may often be told that they are not suitable for dental implants. Our laboratory processes are integrated into the All-On-4 Clinic framework, and as such our clinicians are able to control the quality of the restoration by overseeing the production process. Thus you can rest assured that you will have your final replacement teeth tailored to suit your cosmetic preferences. Speak to your dentist to determine your suitability for having an implant fitted.